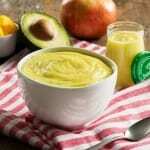 Mango, Apple and Avocado puree | JPMA, Inc. In medium saucepan, place apple with just enough water to cover; bring to boil. Cook for about 10 minutes or until very tender. Add mango in last 5 minutes of cooking time; drain well. Transfer apple and mango along with avocado to baby food maker. Purée in batches until very smooth. Push through fine-mesh sieve. Discard any solids. Spoon purée into ice cube trays and freeze until set. Pop cubes into a resealable plastic bag and freeze for up to 1 month. No baby food maker? No problem! Use a small food processor to purée and push through a fine-mesh sieve to remove any solids.